“Only to learn about the Bible and the warmth of God,” he said. 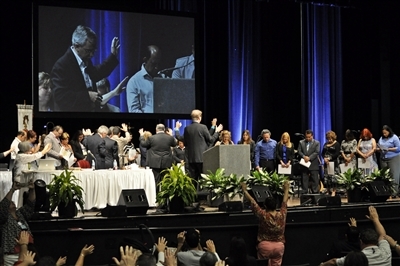 The first Hispanic Academy graduates receive blessings as they are commissioned for lay missioner service at Annual Conference 2014. Photo by Steve Wilkinson. A little more than two years later, he’s been commissioned as a lay missioner through the denomination’s General Board of Global Ministries and is now contemplating ways to use his newfound knowledge and skills to make disciples and minister to the community around his church, Coral Way UMC. After considering the people living in the area, Martinez Cardenas and other academy graduates have decided to focus on two ministries: assisting immigrants, documented and otherwise, and reaching out to elderly people who live alone. Martinez Cardenas was one of 23 Hispanic Academy graduates who were recognized as lay missioners at the Annual Conference meeting in June. Rev. Dr. Craig Nelson, South East District superintendent who also serves on the denomination’s National Plan for Hispanic and Latino Ministry Committee, said the idea for the academy grew out of concern that the church wasn’t adequately reaching out to the growing population of Spanish-speaking people in the U.S. According to Florida Conference Knowledge & Information Services data, Hispanics make up about 24 percent of the state’s population but only 3 percent of the United Methodist laity membership in the conference. 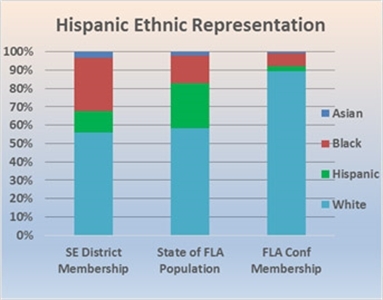 The South East District counts about 13 percent of its membership as Hispanic, the highest share of the nine Florida Conference districts. However, Nelson pointed out, the Miami area’s population is about 60 percent Hispanic or Latino. The Hispanic Academy concept attracted $25,000 a year in funding for four years through the National Plan, Nelson said. The money helps pay for a part-time academy director, Rev. Pedro Jimenez, as well as guest speakers and travel and meeting expenses. Data indicate the percentage of Hispanic United Methodists in the South East District, home to the Hispanic Academy, trails behind the state's Hispanic population but is greater than in the Florida Conference as a whole. Note: A small percentage of other ethnicities is not reflected in this chart. From Florida Conference Knowledge & Information Services. Academy classes have been held mostly at Coral Way, which has classrooms and meeting space for a large number of people, said Rev. Gustavo Betancourt, who also has been active in the academy. About 300 people have completed or are in some stage of academy training. Recently, the program expanded to train leaders in the Sebring area in the neighboring South West District. Nelson said plans include trying to identify training sites in Tampa, Orlando and Jacksonville, where facilitators are available and there’s a significant Hispanic population. Participants in the Hispanic Academy can become certified lay missioners through the General Board of Global Ministries if they complete three modules. Two are prescribed by the church and relate to Bible knowledge, theology, ethics and ministry skills. For the remaining module, participants can choose an academic or continuing education topic. He said the class started with four teenagers and quickly doubled its participation. Classes typically meet once or twice a week, and it’s not unusual for a participant to take two years to complete the required courses. After that, they are encouraged to come up with ministry ideas that will address needs in the community and build the church. Hispanic Heritage Month will be celebrated Sept. 15 through Oct. 15. For resources from the General Board of Discipleship, click here. Participants are encouraged to think beyond the goals of teaching Sunday school or other traditional church ministries. The Hispanic Academy provides the basic skills needed for lay members to operate home churches or small-group worship, he said. Until now, academy classes have been conducted in Spanish. In September, the academy will incorporate classes taught in English at First UMC, Miami. Nelson said that effort will reach out to second- and third-generation descendants of Spanish-speaking immigrants who have adopted English as their primary language. He hopes classes can soon be offered in Creole as well, to address the growing number of Haitian immigrants in the area. Studying the Bible through the academy program is more in-depth than personal readings and Sunday school, he said.